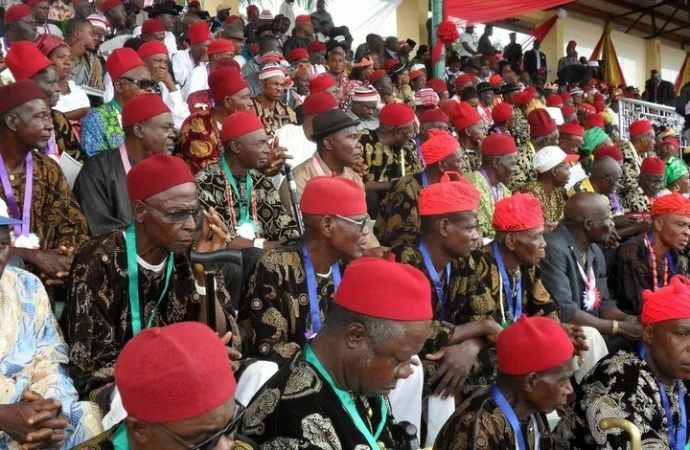 A coalition of Igbo groups, the Eastern Consultative Assembly on Saturday described the recent report submitted by the Malam Nasir el-Rufai-led All Progressives Congress, APC, committee on true federalism as deceitful. They called for a boycott of future elections in Nigeria pending when a new constitution anchored on the principles of true federalism is put in place. This formed part of the decision reached by the group at its emergency meeting held in Enugu. But in the communique was signed by Chief Mrs. Maria Okwor, the Deputy Leader of the ECA and Leader, Igbo Women Assembly, IWA, and Evang. Elliot Ugochukwu-Uko, Secretary, ECA, they said the APC government was merely deceiving Nigerians. According the communique, “the deliberate effort to pretend that they are willing to restructure, designed only for the elections a year away is from the pit of hell. “The designers of this evil strategy know that they have no intention to yield to the sensible clamour to restructure Nigeria. “They know, they made 4 attempts to grab power for only one purpose: to impose their agenda on 180 million Nigerians. The ECA further argued that “turning around to attempt to appeal to the sensibilities of Nigerians who yearn for a genuine restructuring of the polity by pretending they now believe in the same restructuring they claim not to understand what it means, is a clear sign that this ruthless cabal that has destroyed Nigeria in 3 years, has probably became Jittery, after realizing that Nigerians have rejected them. “They therefore, foolishly hope to deceive Nigerians, by pretending they have become born again apostles of restructuring. A ploy they used successfully just before the last elections. “It is pathetic, unfortunate and shocking that this conscienceless oppressor believe Nigerians will buy into their repulsive gambit, that this childish strategy is the most this sick cabal can come up with, speaks volume about their intellectual capacity, that they believe Nigerians are stupid enough to swallow their bait, says much about their loss of touch with the people of Nigeria. “They have simply lost touch with reality. Whether or not this visionless cabal that has divided Nigerians, now believe in restructuring or not is immaterial. “What is surprising is their vain belief that election will hold next year, without a consensual restructuring, of the polity. Their belief that, they would use it once again as a red herring, to deceive the people into voting them yet again is quite idiotic. “Someone should please inform them, that they are not in touch with the mood of the nation. Their deceptive report is not worth the paper it’s written on. “Whereas, returning Nigerian to true fiscal federalism, regional autonomy and resource control, consensually affirmed through a referendum and a new constitution, remains the only way to salvage Nigeria, infantile ploys by vicious elements to continue to hold us all hostage through guile, albeit, making public a deceptive report on restructuring, which they have no intention whatsoever to implement, just so they could fool the people yet again shows how desperate the oppressive cabal destroying Nigeria today, has sudden become. Pity. “For the avoidance of doubt, the people of eastern Nigeria will not participate in any election whatsoever, until a new people’s constitution is evolved through a referendum. “We will not join in the madness of voting in any elections whatsoever, until Nigeria is consensually returned to true fiscal federalism, anchored on regional autonomy. “Those fiddling with the idea, that they would deceive the people with a repulsive report on restructuring are day dreamers whose mental health status needs re-examining. “Nothing on earth will make it possible for the ruthless oppressor who enslaved us for decades, to enslave our children also. Never again. “Accordingly, the ECA will honour the great warrior, Mazi Nnamdi Kanu for forcing the wicked oppressor to identify with the truth for the first time, even if they are pretentiously doing so in order to achieve a certain end. “Kanu will be honoured for opening the eyes of those who were hitherto blind to the atrocious stranglehold of a vicious cabal, who, though in terrible minority, surprisingly holds down bigger nations using the outdated tools of religion, terror, traditional institutions, valuing cattle over human and outright deception to hold us all hostage for decades. Their archaic world view has no place any longer to the realities of today.